There are some Android users who would not give up their smartphones for an iPhone at any price However, there surely is quite a number of these same folks who imagine what it feels like to own an iPhone. For these people, it is now possible to use an iPhone without actually letting go of their Android devices. There�s a new app from CODO DODO Damian Piworwarski, which allows users to emulate the screen design of either the iPhone X or the Essential Phone PH-1. This app is known as Smartphone Upgrader 2017. Smartphone Upgrader 2017 makes this possible by emulating the screen shape of these devices, including the empty spaces where the two devices have their front cameras and various other sensors. It is pretty obvious, though, that this is meant as a joke, to poke fun at these two devices. Users who download Smartphone Upgrader 2017 are met with a sparsely populated UI. This features a few toggles, three buttons, and a banner ad. Thee buttons remain in the same position no matter what you do, but some of the other features can be rearranged. There are also two switches, one labeled Turn your iPhone into an iPhone X, and the other labeled I Prefer Android. 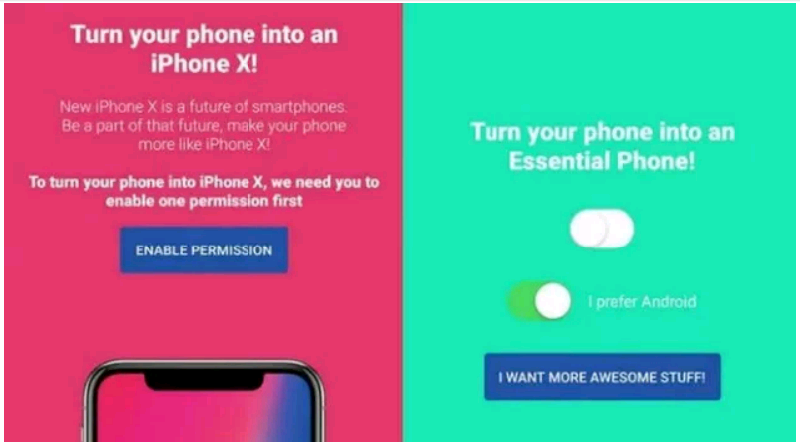 Toggling either switch will lead to a sequence of actions, after which your home screen will show a typical display of either the iPhone X or the Essential Phone. Aside from this, the app is pretty much useless. However, the creators note that this might actually be the whole point of Smartphone Upgrader 2017. According to the creators, the app was developed purely for fun, and it does accomplish this task pretty well. Now, if you refused to allow the app remain installed on your phone for long, it�s surely worth a look.